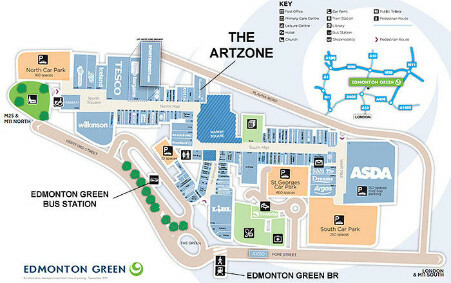 The ArtZone is located within Edmonton Green Shopping Centre opposite Edmonton Green British Rail Station connecting Liverpool Street via Seven Sisters BR and London Underground Station to the South and Enfield Town, Cheshunt and Broxbourne BR stations to the North; it has a modern Bus Terminal with many bus routes going across North London. Once inside the Shopping Centre, head to the Market Square, take the lift or stairs to the 1st floor, then along the balcony to THE ARTZONE, which is located above SUPERDRUG. BY CAR– 5 minutes from the North Circular Road (A406), from Great Cambridge Road (A10) or Mollison Avenue (A5005) to Fore Street. BY TRAIN - Edmonton Green BR station - from Liverpool Street mainline station and Seven Sisters Station (Victoria Line Underground & BR) from the South and Broxbourne, Cheshunt and Enfield Town from the North.